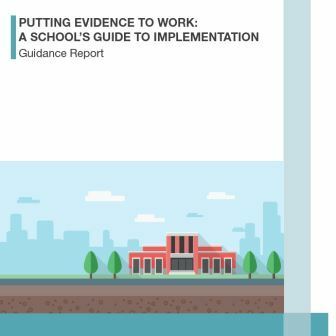 The purpose of this guidance is to begin to describe and demystify the professional practice of implementation - to document our knowledge of the steps that effective schools take to manage change well. This guidance is primarily aimed at school leaders and other staff with responsibility for managing change within a school. Teachers should also find the guide useful in developing a better understanding of how to make practical changes to their classroom practice, as well as their role in supporting departmental or whole school changes.